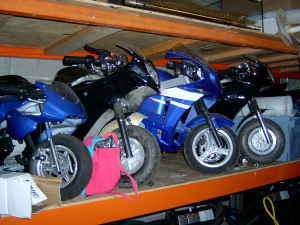 Pocket Bike Forum - Mini Bikes > Pocketbike Tech Talk > 2-Stroke Midbike How 2's > Any x7 big bore heads? 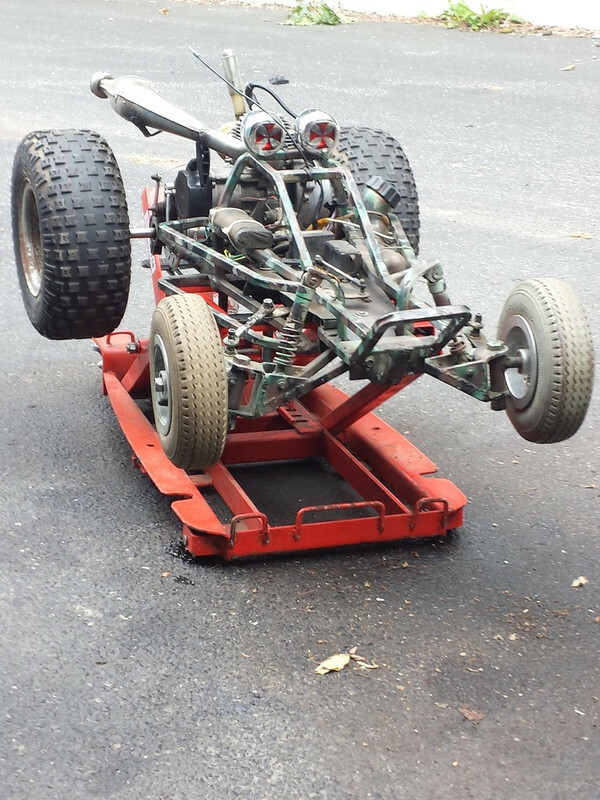 Trying to mod my engine a bit and I think a 70cc big bore would give it some serious power. Any links? Re: Any x7 big bore heads? I think EPR recently got a stihl 60cc head and cylinder with that fit a reed port engine which should fit a piston port. 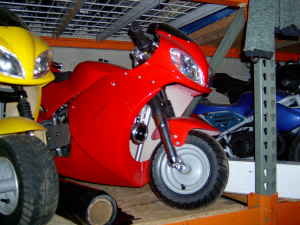 And RCfish put a moped head on a reed port engine which is about 60+cc. Just need to find a cylinder that fits you cases and a piston that fits the crank. Yes, it has a 52mm bore & piston, compared to a 49cc 44mm bore. I tried the P/P cases but the cyld ports would be sideways and you could no mount a coil over the flywheel and the exhaust port would point to the starter housing. On the new cag cases its fits better but the 60cc chopsaw has a longer stroke than the 32mm Cag stroke. Its going to be a lot of work, the hole for the Cyld in the cases is 50mm the piston is 52mm, and it goes into the cases. The bottom of the cyld has no skirt, but have to bore the case hole to 53 to 54mm so the piston can clear. Then I have to screw an alum piece 1/4" thick by 1" round to the top of the piston to fill in space to get a decent compression ratio. Also I have four M6 alum Bling screws for body work, go to cut the heads off & thread them in the OEM M6 threaded case holes w/ red tread sealer, make them flush and re-drill new holes to match the 52mm cyld. Then there is the intake and exhaust ports that are totally weird, have to make the stuff fit some how, lol. But that's the Fun of it, creating something crazy, lol. Found a kit that goes to 53cc. I can port that and install a snake pipe, reed valve, and a massive carbie. All for under $150. Not bad. Going on a bicycle btw. 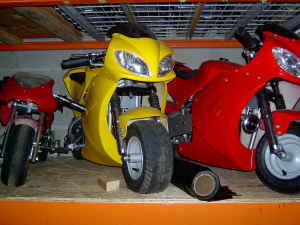 There is no 53cc pocket bike piston port engine, don't believe everything you see, 96% of the sellers lie like a Rug. MPR claimed my 47cc Cag with maybe 3 horses had 5 1/2 hp, it's a bare face lie. Or, they say there Cag will go 45MPH w/ some mods, yeah, if you spend $1,000 or more dollars on a $169 bike. If it has a 44mm bore its a 49cc engine, I do not care what they did to the cyld. The reed ports and three cyld upper port channels and call it up to 54cc, its the some old 44mm bore. If you have a 44mm bore cyld already, there is no bigger, unless you can make a Stihl cyld fit and piston your cases. The word B/B big bore kit came form the early 47cc, really 39cc Cags., 40mm bore and 40mm piston w/ 10mm pin. Then they came out with B/B kit a 44mm cyld & 44mm piston with a 10mm rod pin and bearing to fit the stock crank. The factory 49cc Cags w/ 44mm bore & 44mm piston that has a 12mm pin and a HD 12mm crank. Yeah, I need to take mine off to measure and see if it's a 40 or a 44. How hard is it to switch from a 47cc to a 49cc? Can I use the same crank? Also, any crank mods? I heard of a turbo crank mod but it seems bs. Most of the Walbro carbs from 11mm to 19mm and beyond have a 31mm bolt spacing. A 19mm Walbro HDA223B has the same 31mm. The bore thru the intake manifold can be enlarged. I just got 2 alum X7 15mm intakes and bored one to 15.88mm to match the 16mm Walbro WT 603, put a brass barbed boost bottle fitting on top, & I put it on my scooter engine. You can bore that plastic one .88mm ( .038" bigger ) and mount a 16mm carb. If you can grind, drill, sand and Dremel, at davesmotors in Utah you can get a 16mm GSR40 billet alum intake manifold for $16, and a few mods will mount to your cylinder, part# av760. The best 16mm for the piston port engine is, a WT-813 w/ accell pump, #av522 or 19mm HDA223B purge carb, there is a billet manifold for it too. Last edited by EPR; 07-07-2016 at 11:23 AM. Last edited by CAM2; 02-27-2019 at 03:01 PM. PPC sold me a 49cc engine, piston port, that only has a 42.7mm piston, so they lied. A lot of these sellers make up stuff, or even lie. Don't believe everything you read like the 54cc Cag B/B kit, its a big lie. The big bore kits were made for the first 47cc engines with a 40mm bore. The they were 44mm bore and had a 10mm rod bearing pin. the later 49ccs have a 44mm cyld and piston with 12mm pin to fit the heavier 49cc crankshaft. Look at my red head alloy head piston port engine above in the post. Last edited by MrKitty; 03-02-2019 at 12:23 PM. They stopped making the 2 stroke FS-509 in 2006...The 4 screw intake manifold engine came out around 2009-2010...…. Chances are the engine on your cateye is a replacement engine..
As far as cateyes...Ive had my fair share of them..All had the 2 screw aluminum intake manifold.. This homebuilt r/c buggy has a 44mm 49cc 2004 Cateye engine..wickedly modified of-course..
Last edited by CAM2; 03-02-2019 at 01:02 PM.